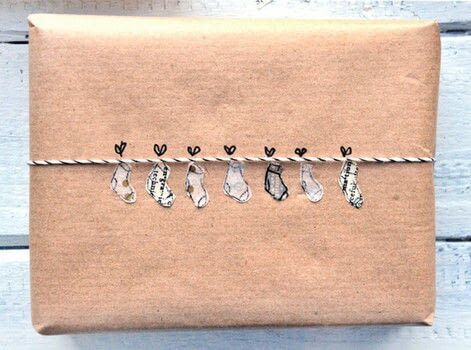 Take brown wrapping paper (craft paper), bakers twine, stamps, muffin paper, washi tape, nuts!! 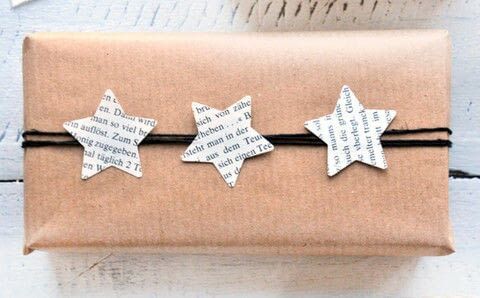 !, a pen and old book pages and wrap you Christmas presents in a simple but beautiful way! Left: Take a dot stamp (or the eraser on your pencil) and stamp on a brown paper bag a white Christmas tree with it. Draw a star on the top. 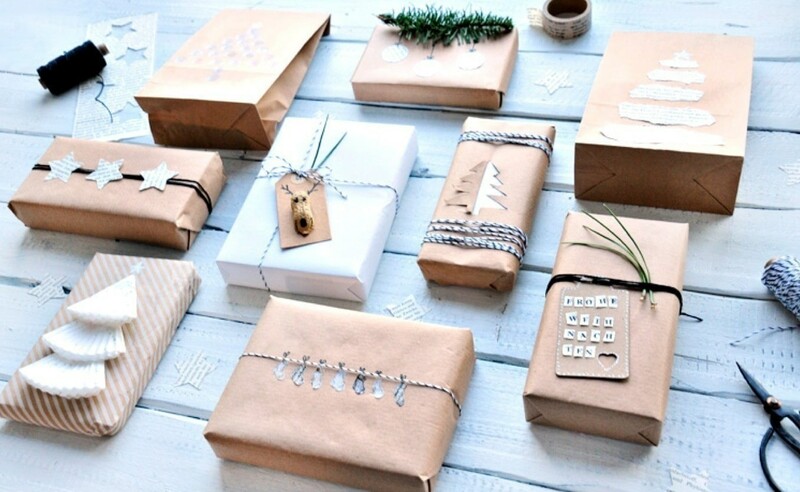 Middle: Wrap your gift in white paper. Draw a symmetric motif on brow paper an cut the outline of half of it. Wrap the brown paper over the white one and open the half of your motif, so the white paper can be seen under it. Right: Rip off some pieces of an old book and glue them to form a Christmas tree. Draw a star on the top of it. Punch some stars out of an old book, wrap your gift and glue the stars over some bakers twine. Wrap your gift the cut out some stockings of washi tape. Wrap bakerst twine around your gift and glue your stockings. Left: Fold three cupcake paper forms (first in half, then in half again) and glue them on your gift. Middle: Cut a peanut in half and glue it on a paper tag, then draw some eyes and antlers. 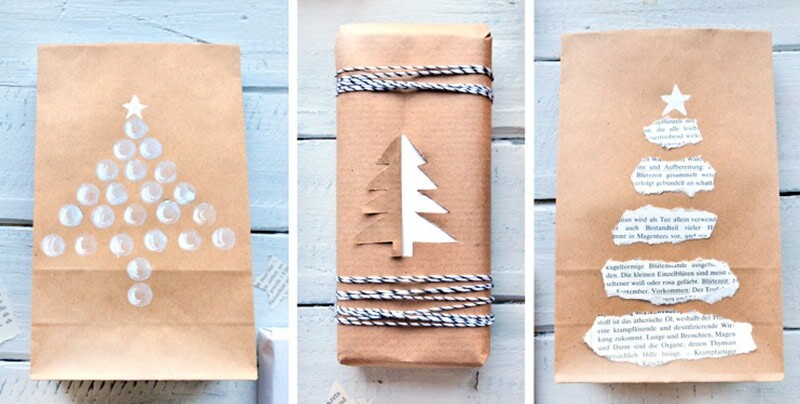 Decorate with bakers twine and pine needles. Right: Cut out letters from an old book and glue them to form a wish ("Merry Christmas" or so) on a tag. Decorate with bakers twine and pine needles. 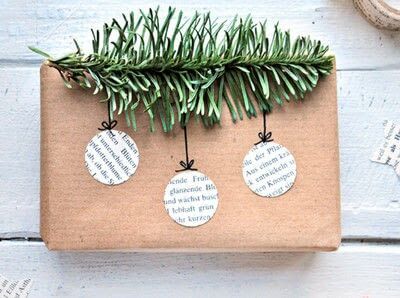 Punch some circles out of an old book and glue them on your gift. Glue (hot glue) a fir branch and draw the "yarn".